Slavenka & Obi: Rainer Werner Fassbinder in "Kamikaze 89"
Rainer Werner Fassbinder in "Kamikaze 89"
The great German director Rainer Werner Fassbinder was no Alfred Hitchcock, in that he did not stick himself gratuitously into every movie he made. He did, however, appear in a lot of his own movies, so if you’re a Fassbinder freak you can amuse yourself by observing his insouciant brutishness on camera. 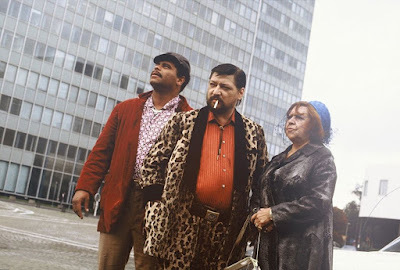 Fassbinder did act in other people’s movies on occasion. 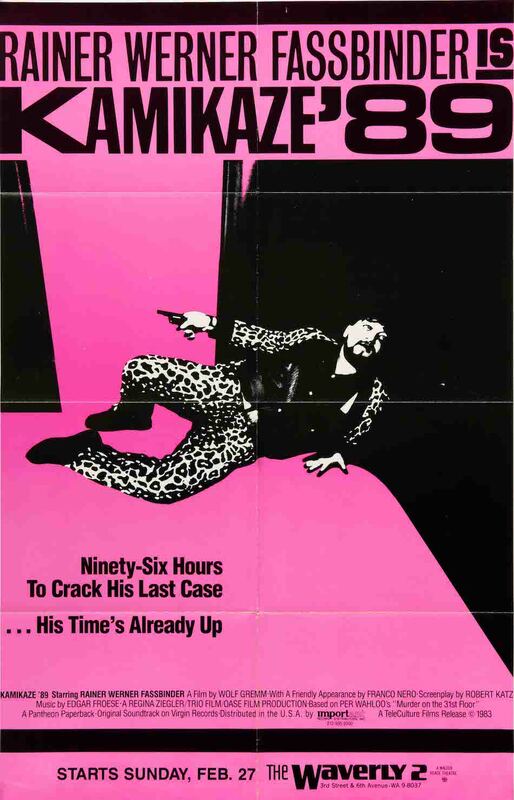 Fassbinder’s last starring role occurred in an amusing cyberpunk “thriller” (ahem) called Kamikaze ‘89 directed by a close friend of his named Wolf Gremm. The movie was released in 1982 but (as the title suggests) is set in far-off 1989, when Germany has become a totalitarian dystopia in which all problems are purported to have been solved (there hasn’t been a suicide in four years) and “everything is green,” whatever that means. The mandated diversions of the “bread and circus” formulation come in the form of state-sponsored “laughing contests.” In this edenic setting we follow a police lieutenant named Jansen (played by Fassbinder) who is trying to solve a string of murders mysteriously connected to an all-powerful conglomerate (“der Konzern”) which is run by a man calling himself the Blue Panther.